from the cosmological N-body simulation Aquarius. The brightness of the image is proportional to the logarithm of the squared dark matter density along the line of sight. (Image credit: Aquarius project). Dark matter constitutes about 85% of the total matter content of the Universe. However, its nature is still unknown. The H.E.S.S. 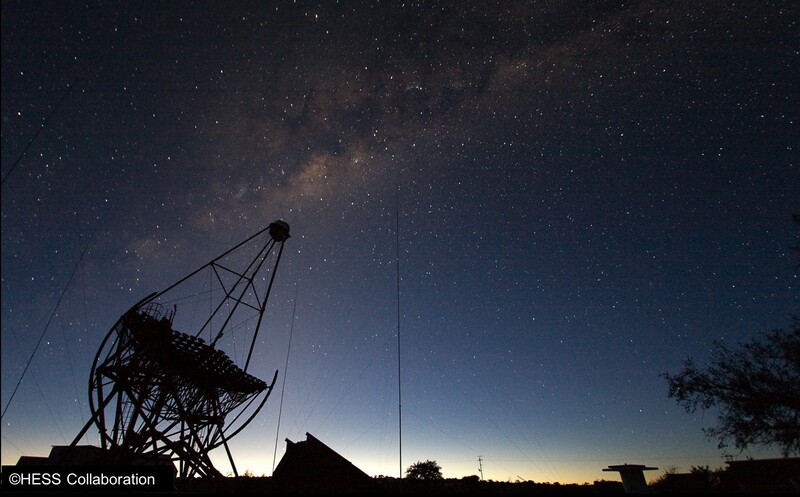 observatory located in Namibia scrutinizes the central region of our Galaxy to search for mono-energetic gamma rays from the collision of hypothetical WIMPs, primary elementary particles that are among the leading candidates for dark matter. The search carried out with 10 years of observations of the center of our galaxy with phase 1 of H.E.S.S. has come up empty but provides the strongest constraints to date on the annihilation cross section of WIMPs in the TeV mass range. These results have just been published in Phys. Rev. Lett. 120, 201101 (2018), (arxiv:180505471). Cosmological (large scale structures forma-tion) and astrophysical (galaxies dynamics) probes point towards the existence of non-baryonic dark matter as a major compo-nent of the total density of the Universe. Its nature is still unknown. Several ele-mentary particle dark matter candidates are suggested in theories beyond the Standard Model of particle physics. Among these par-ticles, one of the most promising candidates is the WIMPs, a class of massive particles that interact weakly with matter. Assuming weak interaction scale, such particles of mass from GeVs to hundred TeV acquire a relic density compatible with the cold dark mat-ter density of the Universe. Searches for dark matter have been conducted at colliders, e.g LHC at CERN, and via direct searches in deep underground laboratories, like Xenon, LUX and Edelweiss. These experiments have pushed dark matter masses in the few hundred GeV range. Observations with ground-based arrays of Cherenkov telescopes, like H.E.S.S., give a unique opportunity to detect WIMPs in the TeV mass range. Fig. 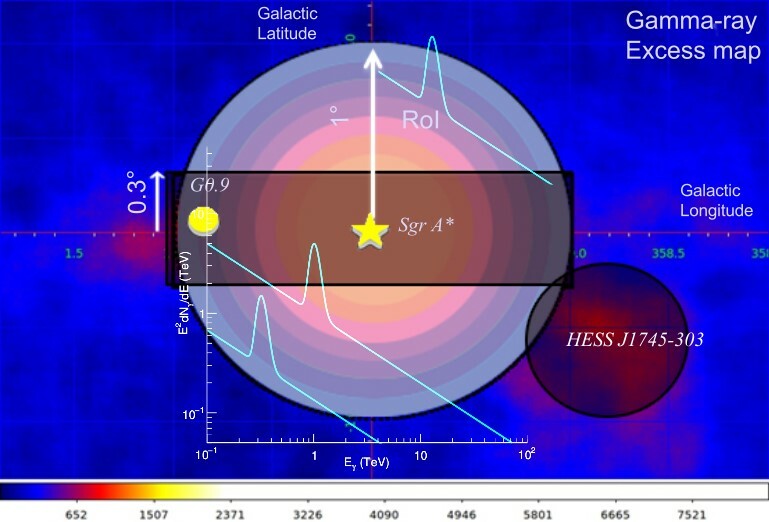 2 : Gamma-ray excess map of the inner 300 parsecs of the Milky Way seen by H.E.S.S.. The regions of interest used for the search for mono-energetic gamma-rays are represented as concentric rings of width 0.1?. The regions of the sky where standard astrophysical sources at very high gamma-ray energies are detected, are excluded. Among them are HESS J1745-290, G0.9+01, HESS J1745-303 and the Galactic plane di?use emission (shaded box and circle). Some signal-like monoenergetic lines are overlapped to the map: they correspond to Gaussian functions centered at the WIMPs dark matter mass, with width 10% of the energy. When two WIMPs annihilate, Standard Model particles are created. Among them are gamma-rays of very high ener-gies (VHE, E> 100 GeV) pro-vided the dark matter mass is large enough. In particu-lar, since the annihilation pro-cess takes place at rest (the relative WIMP velocity is of the order of one thousands of the light speed) a mono-energetic gamma-ray emission is expected at the WIMP mass (DM DM → γγ). This signa-ture can be easily distinguish-able from the otherwise contin-uum spectrum expected from standard astrophysical sources. The searches with VHE gamma-rays focus on the re-gions of the sky where the largest dark matter densities are expected. The inner part of the Milky Way is an optimal target for the search of mono-energetic gamma signals due to its important dark matter content. In addition, thanks to its proximity a faint signal from the Galactic Center would be easier to detect than in the dwarf galaxies satellites of the Milky Way. On the other hand, the Galactic Center region hosts many standard VHE gamma-ray sources. Among them there are the supermassive black hole Sagittarius A*, supernova remnants and pulsar wind nebulae, as well as a di?use emission along the Galactic plane. These regions are dominated by standard astrophysical emission and are ex-cluded from the analysis (see Fig. 2). Fig. 3 : One of the Imaging Atmospheric Cherenkov Telescopes of the H.E.S.S. observatory, pointing toward the centre of the Milky Way. The H.E.S.S. observatory is set in Namibia at an al-titude of 1800 m. The experiment is composed by four telescopes of 12 m diameter and a big tele-scope of 28 m diameter in the middle of the array. The H.E.S.S. observatory, set in Namibia at 1800 m above the sea level, is com-posed of Imaging Atmospheric Cherenkov Telescopes (Fig. 3). The H.E.S.S. telescopes al-low us to detect VHE gamma-rays by detecting the Cherenkov light produced by showers in-duced during the interaction of the gamma-rays with the Earth atmosphere. The phase 1 of H.E.S.S. made out of four tele-scopes of 12 m diameter started in 2004. The phase 2 started in 2012 and includes an addi-tional larger telescope of 28 m diameter, installed at the cen-ter of the pre-existing array. Located in the Southern hemisphere, H.E.S.S. is in an optimal position to observe the center of our Galaxy. The observation campaign performed in 2004-2014 included the four telescopes of H.E.S.S. phase 1.The campaign allowed to accumulate a huge data set towards the central region of the Milky Way, with more than 250 hours of exposition at the Galactic Center position. Thanks to the large statistics gathered with the ?rst four telescopes of H.E.S.S., the data analysis can fully exploit the spectral and spatial characteristics of the dark matter signal with respect to the residual background for an optimized search. With this large data set, H.E.S.S. reached an unprecedented ?ux sensitivity in the direction of the center of our galaxy. While no mono-energetic gamma-ray signal is detected in this region, the observations enable the H.E.S.S. scientist to set the most stringent constraints on the dark matter annihilation cross section in the WIMPs mass range, at energies between 300 GeV and 70 TeV. These limits improve the previous results published in 2013 of a factor up to 6. These limits exclude annihilation cross sections in two photons down to 4×10−28 cm3 s−1 for WIMP masses at 1 TeV (see Fig.4a). Fig. 4a : constraints on the annihilation cross section (σv) of dark matter particles in two photons obtained from 10 years of observations with H.E.S.S. towards the inner 300 parsecs of the Milky Way. These constraints are represented in terms of upper limits at a 95% con?dence level on the dark matter annihilation cross section versus the dark matter mass. The values of (σv) above these points are excluded. The observed limits are shown in red. The expected limits (black solid line) with their 68% (green bands) and 95% (yellow boxes) containment bands are shown. The blue points represent the limits obtained with 4 years of observations published in 2013. The grey- shaded region represent the natural scale for the dark matter cross section, i.e. the expected thermal relic cross section. Fig. 4b show a comparison of the limits on the annihilation cross section into two photons obtained by H.E.S.S. 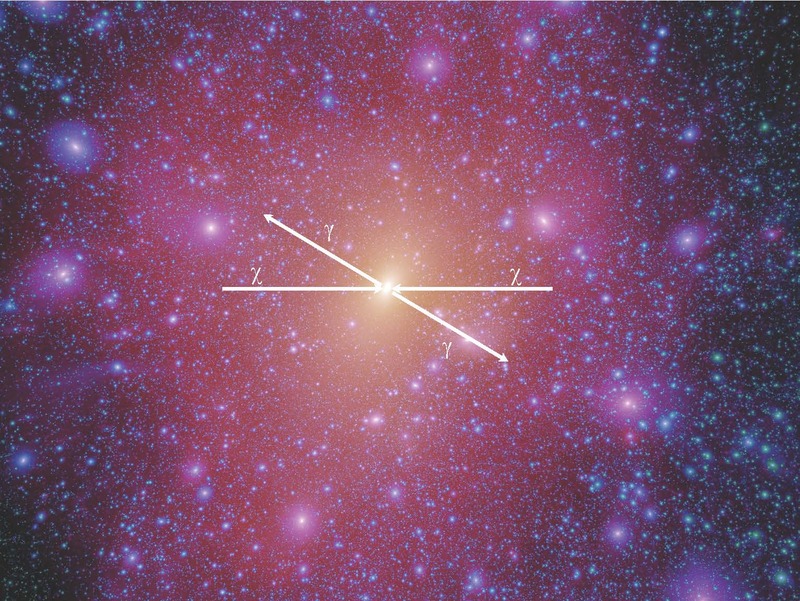 at the Galactic Center (this publication), with those obtained by the Cherenkov telescope MAGIC towards the dwarf galaxy Segue 1 and by the Fermi space satellite toward the centre of the Milky Way (the excluded values of σν lie above the points). The constraints obtained by H.E.S.S. overcome those from other gamma-ray experiment in the TeV mass range. These results show the uniqueness of H.E.S.S. to the search for WIMPs in the TeV mass range. In thie region of the parameters space H.E.S.S. is leading the quest among the VHE observatories. Fig. 4b: comparison of the annihilation cross section into two photons by H.E.S.S. 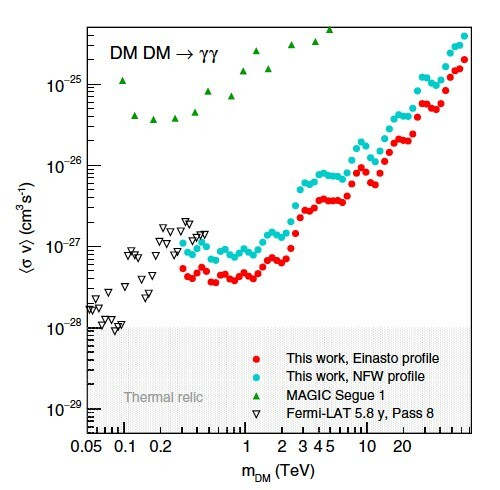 for two types of dark matter density profiles radial distributions (Einasto et NFW). These limits are also compared to those obtained toward the inner Galactic halo from the Fermi satellite observations and towards the dwarf galaxy Segue 1 from MAGIC observations. The grey-shaded region represents the natural scale of WIMPs annihilation into two photons. The gamma-ray observations with H.E.S.S. have reached the sensitivity needed to probe cross sections expected for thermally-produced WIMPs in the primor-dial universe. The potential of H.E.S.S. is unique to follow up with dark matter searches in the region of the Galactic Center. The observations carried out with the phase 2 of H.E.S.S., including a lowered energy threshold, will enable to improve the sensitivity to gamma-rays in the energy range below a few TeV. Since 2014 H.E.S.S. is performing a survey of the kiloparsec-sized region around the centre of our galaxy in order to both improve the potential of detec-tion of dark matter signals, and reduce the impact of the uncertainty on the dark matter distribution in the inner region. The upcoming searches will be crucial to constrain TeV dark matter models TeV before the advent of the Cherenkov Telescope Array (CTA) observatory in 2024. Thanks to an important gain in sensitivity of a factor of 10 in the TeV energy range, observations of the Galactic Centre with the Southern CTA array may provide a crucial test for a large class of WIMP models at the TeV scale.